Step inside this luxurious, stunning home which offers 4 bedrooms and a separate 2-story guest suite. 2 sets of panoramic-style doors and numerous windows allow you to enjoy the stunning views of the community park and your own spectacular spa and firepit in the courtyard. Stainless-steel Kitchenaid appliances, granite countertops and a large island complete this dream kitchen. Upgrades such as maple flooring and marble countertops can be found in almost every room. This exclusive floorplan offers two covered balconies off the master suite. Master bath includes an oversized shower, a soaking tub and 2 organized walk-in closets. This expansive home has abundant storage throughout and is served by a salt-free water filtration system, a tankless water heater, an electronic air-cleaner, 32 fully-paid-for solar panels, two whole-house fans, two air conditioning units and three split A/C units. This home in Greenwood of Tustin Legacy is conveniently located across the road from resort-like amenities including grills, pool/spa, park, clubhouse and more. Within walking distance to the District shopping center and the Village shopping center at Tustin Legacy with numerous restaurants, stores and movie theaters, life just doesnât get better than this! 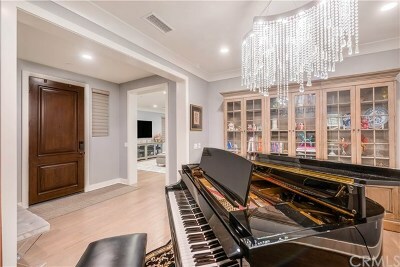 Come by and fall in love with not only this spectacular house but the lifestyle of living in the O.C!